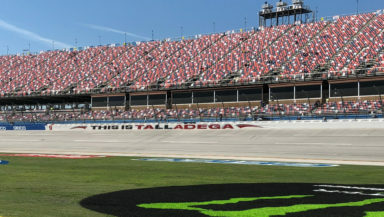 The NASCAR Camping World Truck Series resumes action and continues their Playoff run this weekend at Talladega Superspeedway. Currently, there are 36 trucks on the preliminary entry list. Here’s a look at who might wind up in victory lane on Saturday and there could be a possible upset. 1. Parker Kligerman – Kligerman is the recent and defending winner of this race. In four races, he has two wins in 2012 and 2017, three top fives and three top 10 finishes. Kligerman also has an average start of 12.8 and an average finish of 8.5. He led three laps en route to his second victory and finished 10th in Stage 1. While you could consider him an upset, Kligerman has run up front the past few races. 2. Johnny Sauter – Sauter excels as a superspeedway racer of late. He scored the victory at the season opener at Daytona in February. At Talladega, he has nine starts, one win in 2013, three top fives and five top 10 finishes, along with an average start of 13.0 and an average finish of 10.2 with one DNF. Sauter won both stages last year after starting second but wound up finishing 12th. He’s led 47 laps in his career at the 2.5-mile superspeedway. Keep an eye out for Sauter and the No.21 GMS Racing team this weekend. 3. Grant Enfinger – Enfinger has recently been strong at Talladega. It was the site of his first career win in 2016. Since then, he has collected two top fives and two top 10 finishes. Enfinger has an average start of 11.2 and an average finish of 9.8, along with 62 laps led and one DNF. He finished fourth in last year’s race after finishing 10th in Stage 2. He’s already locked into the next round with his recent victory at Las Vegas. 4. Timothy Peters – Peters is back in the No. 25 GMS Racing Chevy this weekend. At Talladega, he has eight starts and two wins (2014, 2015) among four top five’s and five top 10 finishes. Peters has an average start of 15.6 and an average finish of 10.0. His last start came two years ago in 2016, where Peters started sixth and finished third after leading 14 laps. 5. Myatt Snider – Snider could surprise the field this weekend by scoring his first ever Truck Series victory. In his lone start in 2017, Snider started ninth and finished third after finishing fifth in Stage 1 and third in Stage 2, respectively. There have been 12 races at Talladega for the Truck Series. The first one coming back in 2006, when Mark Martin was the inaugural winner. Since then, Todd Bodine, Kyle Busch, Mike Wallace, Parker Kligerman, Johnny Sauter, Timothy Peters, and Grant Enfinger have all visited victory lane. Of those winners, Bodine, Busch, Peters, and Kligerman are the only ones to have repeat wins. Peters and Kligerman are the only repeat winners entered. The lowest a race winner has ever come from was 26th in 2014 set by Timothy Peters. The highest a race winner has come from was the pole three times, set by Martin in 2006, Bodine in 2007, and Peters in 2015. There have been some close finishes at Talladega since the first race back in 2006. In 2007, Todd Bodine beat Rick Crawford to the line by .014 seconds. In 2008, Bodine won again by .074 seconds over Ron Hornaday Jr. In 2009, Kyle Busch made a last lap pass on Bodine and Aric Almirola by .057 seconds. The same happened again in 2010 with Busch edging Almirola by .002 seconds, the closest finish since then for the Truck Series at Talladega. In 2011, Mike Wallace won, beating Hornaday by .057 seconds. 2012 saw Kligerman passing James Buescher on Lap 93 to win under caution. 2013, Johnny Sauter took the checkers by passing Ross Chastain on Lap 94 to win under caution. In 2015, Peters passed Brandon Jones on Lap 97 to win back to back. In 2016, Enfinger won by .107 seconds. Kligerman won last year’s race by taking the lead on Lap 94 and was scored the victor as the caution came out. It will be a busy day on Friday for the truckers. The first of two practices is scheduled for 10:05 a.m. ET with the final practice slated for 11:35 a.m. ET, all on FOX Sports 2. Qualifying will take place later in the day at 5:35 p.m. ET on Fox Sports 2 with a tape-delayed version on FOX Sports 1 at 9:00 a.m. ET. Live coverage begins with race day on FOX at 12:30 p.m. ET. The green flag is scheduled to drop at 1:10 p.m. ET on FOX and MSN Radio.